Now in Rose Gold. The Kaby Lake update adds little to an already excellent XPS 13 experience. Users will only see marginal benefits in both performance and battery life when compared to the outgoing Skylake XPS 13. Of late, there seem to be more and more offerings of laptops striving to be borderless. It is easy to be blown away with displays which are not interrupted visually by frames. The same is true with Dell’s XPS 13. Dell claims that it is “the smallest 13-inch on the planet with the world’s first InfinityEdge display. 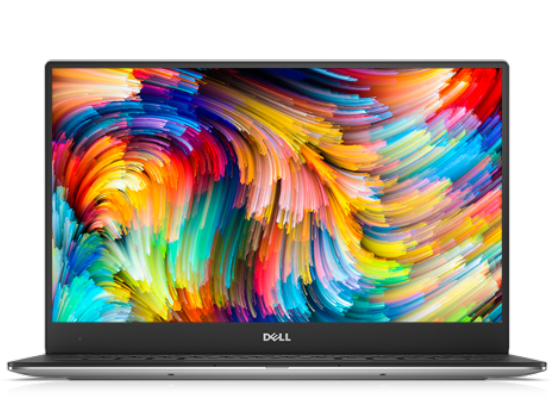 It is remarkable how Dell managed to squeeze in a 13-inch display within what is normally a 11-inch frame. Its bezel measures at 0.5mm, thereby making the display almost frameless. Its dimensions measure at 15mm x 304mm x 200mm and weighs only 2.7 pounds. Essentially, this is the same body as the previous version of the XPS 13 with some minor changes on the inside. What is even more impressive is the UltraSharp QHD display with a resolution of 3200 x 1800. This boosts visuals up to 5.7 million pixels (276 ppi). Details appear in stunning clarity on its IGZO IPS panel as it allows a wide viewing angle of up to 170°. Usage outdoors is not an issue with its 400 nit brightness. By adding the touch option, users may tap, swipe and pinch their way around the screen. The Corning Gorilla Glass coating makes the display even more scratch resistant. Perfomance-wise, the XPS 13 is fully loaded just like the previous versions. It is now powered by the newer 7th Generation Intel Core i7 processor. This comes with 8GB memory, and a 256GB SSD hard drive. The palm rest stays cool even after prolonged use as it is made of carbon fibre. This machine is very well connected (literally) as is fitted with 2 USB 3.0 (1 with PowerShare), 1 SD card reader, 1 headset jack, 1 noble lock slot, 1 Thunderbolt 3 which supports Power in/charging, PowerShare, Thunderbolt 3 (40Gbps bi-directional), USB 3.1 Gen 2 (10Gbps), VGA, HDMI and ethernet via Dell Adapter (sold separately). The docking solution which is offered as an option is top-notched as it features single-cable connections for power, ethernet, audio and video. Users may also opt for Killer Wireless technology which maximizes bandwidth to provide optimal speeds. With the built-in Dell Data Protection and Endpoint Security Suite Enterprise, potential threats are held at bay and testing has shown Dell’s protection is significantly more effective against threats compared to traditional top antivirus solutions. Moreover, its battery is said to be able to last 22 hours of continual use when running productivity applications. However, users have reported that the machine shows a much shorter run time. Dell can’t be blamed though. Intel’s new processors seem to adjust their power consumption vigorously depending on the running application. It is harder for Windows to predict proper timing in these conditions. The optional Dell Power Companion grants users additional juice of 11 hours and 30 minutes. In all, the XPS is definitely a business laptop to look out for but it does come with a hefty price tag. 91.05%: There do not exist many models, which are rated better. The most ratings get ratings, which are a bit worse.